With the ever-increasing demand on physical therapists to develop the most effective treatment interventions comes this invaluable imaging resource covering exactly what you need to know! Diagnostic Imaging for Physical Therapists gives you the knowledge to understand the basic principles of musculoskeletal imaging and how to interpret radiographic images in your physical therapy practice. This straightforward, highly illustrated text is organized by body region and covers all the fundamentals with an emphasis on standard, two-dimensional x-rays. An accompanying DVD delivers high-resolution copies of the images in the text along with interactive activities to enhance your understanding of the material. 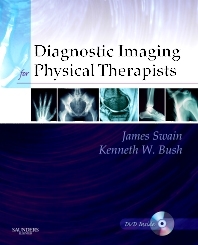 With this indispensable text, you’ll recognize when diagnostic imaging is necessary, and you’ll be able to interpret the results with confidence. Written specifically for PTs, this book covers the most common film images you will see in your practice and introduces you to some of the not-so-common images. UNIQUE companion DVD helps you hone your diagnostic imaging skills with high-resolution radiographic images and animations. DVD icons in the book direct you to interactive exercises including ABCs, pathologies, case studies, and quizzes that will enhance your understanding of concepts in the text. Provides you with a “systematic” basis for approaching the interpretation of standard films. The body system approach of the chapters makes it easy to find information specific to a body region. Text edited by highly respected experts in musculoskeletal rehabilitation gives you authoritative guidance on the management of musculoskeletal pathology and injury.